Olson & Olson represents cities, counties, special districts, and other units of local government in court. They are the municipal government’s law firm. During our Analysis & Discovery phase, we performed Competitive Analysis with several of their competitors. We found a fatal flaw with one of them. We used that information to guide the architecture of the site and make sure we didn’t make the same mistake for Olson & Olson. 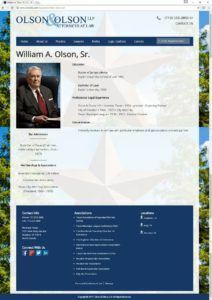 During the Design & Development phases, Develare created a mobile responsive website for Olson & Olson that showcases their Texas roots. Also, we created a custom WordPress Dashboard so that their clerks can easily keep up with changes to their attorney bios without needing to delve into code. The new Lawyers section of the website consistently displays each attorney. In addition, as new attorneys are added the Lawyers page is auto-updated. How much does a law firm website design cost? Less than you might think. If you’d like to learn more, call us at (281) 552-8717 or fill out the quote form below.